What happens when you collide science, food, engineering and zaniness? You get Beakerhead 2018. Alberta Canola grabbed the opportunity to be one of the sponsors of the 2018 edition of this incredible festival held every year in Calgary. (For full details consult: www.beakerhead.com) As Beakerhead, is an all-access consumer event, how does Alberta Canola fit in? 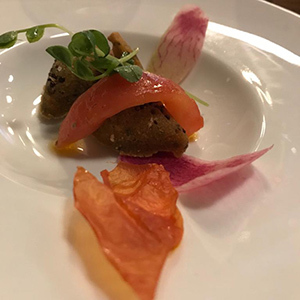 Beakereats, the culinary arm of Beakerhead, organized six chefs and a mixographer to make Canola the star of the culinary show. The Chef’s Collaborative Dinner was a six-course path of experimentation featuring Canola oil and Canola meal. The opening item was the “Bloody Airdire”. 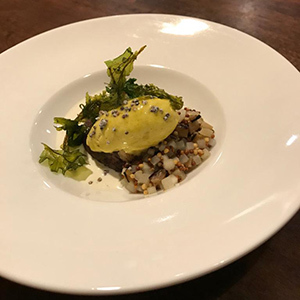 (Airdrie is the community just north of Calgary, where the Beakereats team of chefs toured a canola farm for culinary inspiration.) This original spin on the Bloody Mary cocktail had glasses partially rimmed with canola oil and then dipped in canola meal. The garnish was, of course, canola sprouts. 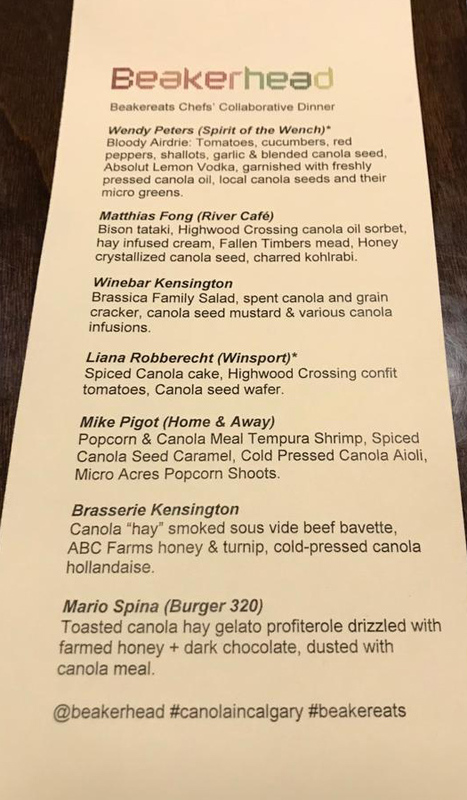 Who knew that canola could be featured in a cocktail? Moving on through the menu, the appetizer course of Bison Tataki featured Canola oil sorbet and honey crystallized canola seed. 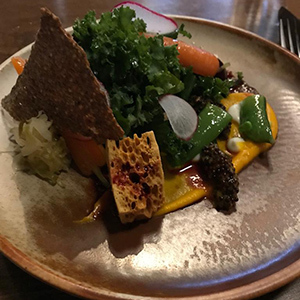 Paying homage to the entire Brassica Family, Chef Mitchell created a salad of greens with canola seed mustard, canola infusions and a specially made cracker made from grains and canola meal. The cracker was so good that guests were asking for super-sized take home bags to enjoy. Tiny spiced canola cakes followed the salad and then the popcorn shrimp arrived. This was an ultra-novel take on the popular snack. Actual popped popcorn merged with the canola meal to make the tempura batter for the shrimp. The dipping sauce was canola aioli with spiced canola seed caramel on the side. So much canola creativity was experienced and there was still the entrée and dessert to come! Chef Jorel described to the guests how he took whole canola plants, heated them to the smoking point in the oven and used the charred plants to flavour the beef entrée. The meat was unbelievably tender and had the perfect partner in the canola hollandaise sauce. Finally, Chef Spina described how he too had smoked whole canola plants in his oven and then infused cream with the smokiness. Chef then created dessert – a gelato made with the infused cream. The gelato was served sandwiched in a profiterole made with canola oil, drizzled with chocolate and sprinkled with canola meal. 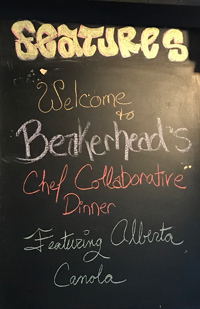 Guests were thoroughly impressed by the experience that was Beakereats and specifically this Chef’s Collaborative Dinner. The guests were also treated to a science lesson on the history of canola development. Greetings were also shared from Alberta Canola and its member growers. Guests departed the event with their own bottle of Canola Oil, inspired to use this extremely versatile ingredient.